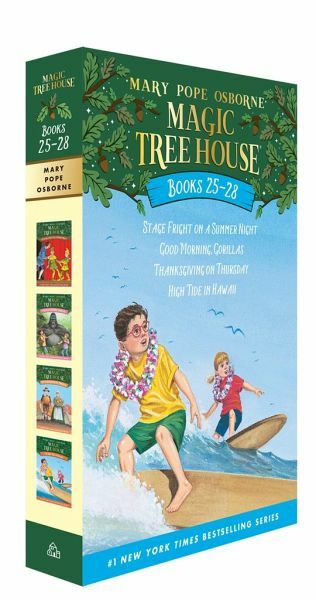 Books 25-28 of the 1 New York Times bestselling Magic Tree House series boxed together for the first time! These four titles are the perfect gift for a Magic Tree House fan or any child who loves a good adventure. Parents, teachers, and librarians use the chapter-book series as a tool to promote reading, as even the most reluctant readers want to know where the magic tree house will take the brother-and-sister team next. 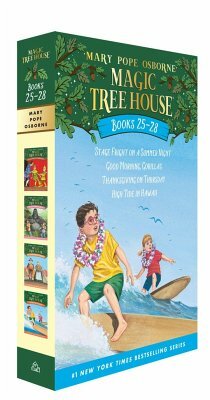 In books 25-28, travel all over the world and across time in the magic tree house! Jack and Annie are just regular kids, but Morgan le Fay, the magical librarian, thinks they're ready to learn some magic. What kind of magic? Find out when Jack and Annie meet William Shakespeare, a group of gorillas, the Plymouth Pilgrims, and a couple of great surfers from Hawaii! Books in this set include Stage Fright on a Summer Night (25), Good Morning, Gorillas (26), Thanksgiving on Thursday (27), and High Tide in Hawaii (28). For games, contests, and lots more fun, check out MagicTreeHouse.com!